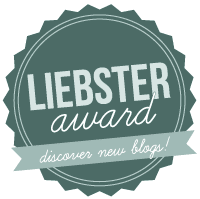 I woke up a couple of days ago to find out that I've been nominated for a Liebster Award by Kelly over at Dream In Lace. I've enjoyed reading her posts on Paris and Milan fashion week. Give her a read if you haven't already! 1. If you had time for only one item of makeup, what would you choose? This is a tough one! It's definitely between eye liner and foundation. I think I'd choose foundation because of my scars from when I had bad acne as a teenager. It covers them up and I feel more confident. 2. Where's your favorite place in the world you've traveled to? Surprisingly, I've never been outside of the U.K. 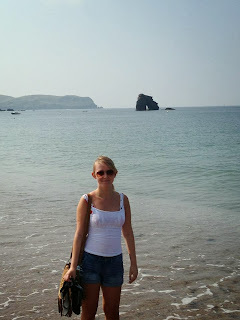 I hope this changes next year but for now my favourite place is the Isle of Wight or maybe even Thurlestone in Devon. I like really quiet places compared to where I live in West London. I live near Heathrow Airport so it's nice to get away from the noise. 3. What's your biggest guilty pleasure? Definitely reality shows like Made in Chelsea, TOWIE and Geordie Shore. They are so addictive - I love to chill out in the evenings and watch them. I've met Spencer and Binky from MIC. Nope but I do own a guitar. I took up lessons in year 5 but I hated my teacher so I never carried on. 5. If you could choose one store to get unlimited free clothes from, who would you choose? Everyone who knows me will know the answer to this question - Topshop. I get a voucher every Christmas from my parents because they know I absolutely love their clothes. They have really pretty pieces that I can't get enough off. I'm rubbish at putting eye liner on. I usually do it too thick or I just mess it up somehow, and it's never a smooth line. No matter how much practice I have I can never get it right the first time. The last book I read was Storm of Swords Part 2. I loved it so much and was shocked so many times that after I was done I threw it to the floor and jumped up and down. I'm very passionate about these books and the series haha. My graduation actually inspired me to start writing this. I realised that education wasn't really my thing anymore, and that I wasn't getting the support I needed. I massively lost interest in my third year and threw myself into extra curricular things. I think I got more out of those sort of things than I did with my degree. I decided I wanted to be creative on my own terms and that's how this blog started! 9. Can you cook? If so, what's your best dish? No! If you ask my old housemates they will tell you that I used to live off ready meals and pasta. I can do a nice stir fry. But even that doesn't require much effort! 10. What are some must-have items everyone should have in their wardrobe? A girl has to have an LBD (obviously), wedges, black heels, skinny jeans, a staple jumper, sandals and a floral top. I've developed an addiction to florals this year! 11. Would you rather cut off all your hair or never be able to cut your hair again? I think I'd choose cutting off all my hair. It grows back and you can wear a wig or cute head scarves in the meantime. I wouldn't want hair like Rapunzel. The maintenance to keep it tidy would be ridiculous! 1) What's your favourite beauty product? 2) Would you rather never wear make up again or never brush your hair? 3) If you could live anywhere in the world where would it be? 4) What's your favourite item of clothing in your wardrobe? 5) What's your favourite hair product? 6) What's the best book you've read lately? 7) What are your favourite blogs to read at the moment? 8) If you could eat one meal for the rest of your life what would it be? 9) What's the worst film you ever watched? 10) What is your favourite time of year?